Dr. Bruce Jeffries grew up near East Liverpool, Ohio. His interests in science and healthcare led him to major in Biology and Chemistry at Youngstown State University where he was a University Scholar. From Youngstown Dr. Jeffries decided to pursue his dream of becoming an eye doctor and moved to Columbus, Ohio. There he earned his Doctor of Optometry degree from the Ohio State University School of Optometry in 2001 and developed his love for the Buckeyes. O…..H….I….O! Dr. Jeffries spent an extra year training at Lighthouse International and SUNY College of Optometry in New York City working in the areas of ocular disease and vision rehabilitaion. 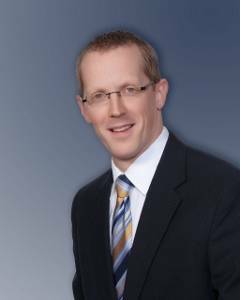 Upon moving back to Ohio, Dr. Jeffries worked with a large ophthalmogy practice in Youngstown, Ohio. These experiences gained him invaluable knowledge that he is excited to bring to the Sebring and New Middletown areas. Dr. Jeffries believes in looking at the big picture when it comes to your eye health, so we take the time to get to know you, your eye care history and your vision needs. We know that getting the right prescription involves balancing several factors, including clear eyesight, visual efficiency and your ability to process visual information seamlessly. Whether you need a routine eye examination, an eyeglasses fitting or treatment for eye disease (such as glaucoma or macular degeneration) or eye surgery (such as LASIK or cataract surgery), Dr. Jeffries will provide you with the best care, advice, options and follow up. Along with being active in the community, Dr. Jeffries regularly provides vision education programs at local schools. If you are interested in Dr. Jeffries speaking to your school or group please contact his office. He is always interested in speaking about eye care topics! Dr. Jeffries currently lives in Columbiana, Ohio with his wife and best friend, Angie. They are the proud parents of daughters Vivian and Camille, and love to spend time together as a family. When not taking care of eyes, Dr. Jeffries enjoys travelling, exercising and pursuing a deeper relationship with God.